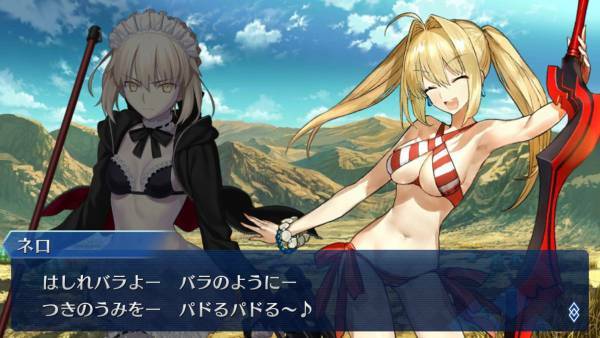 In the short Nero in a Santa outfit sings a "Jingle Bells" with some rather casual lyrics. The lyric is a song of this clip (for the full clip, click here). The song sounds like a "Jingle Bells", but the subs don't seem to match up with the spoken dialogue ("Laughing all the way" as a translation for "padoru padoru"). What is the meaning of "padoru" in the context the short or song? After digging for a while on Japanese Q&A sites and forums, most people seemed to have concluded that it's referring to a "Paddle", as in an implement to whip the reindeer with. However like the Western community, they have about as much of an idea as we do on what it's actually supposed to mean as I don't think there's even been an official comment on its meaning, there's even a difference between how people think it's supposed to be written, as パドル or パドる, the difference being the later is a verb and the former being just a noun. Either way, this song is completely made up, it's just for TYPE-MOON ACE, so it could just as easily be utter nonsense gibberish to fill in the tune. The OP opens up asking what the Padoru (パドル) part means and some correct him that it's normally パドる, some say otherwise, however as far as I can see, パドる is more a widely accepted way of writing it, with pixiv dic and many YouTube videos seeming to have this spelling. It's not the noun "Paddle", it's the verb "Paddle", as in the act of Paddling, or at least that's how I interpreted it. Not the answer you're looking for? Browse other questions tagged japanese-language culture fate-extra or ask your own question. What does Ni no Kuni mean exactly?